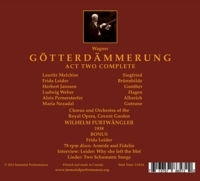 “If you think those who talk about a greater age of Wagnerian singing than we have experienced in the postwar era are suffering from the ‘it was always better in the good old days’ syndrome, this disc will cure you of that misconception. This is Wagner as I have never heard it in live performance anywhere, and I’ve heard Wagner in Bayreuth, at the Met, and in Vienna, Berlin, Zurich, Tokyo, Chicago, and many other places over 50 years of listening. Would that it were the whole opera. 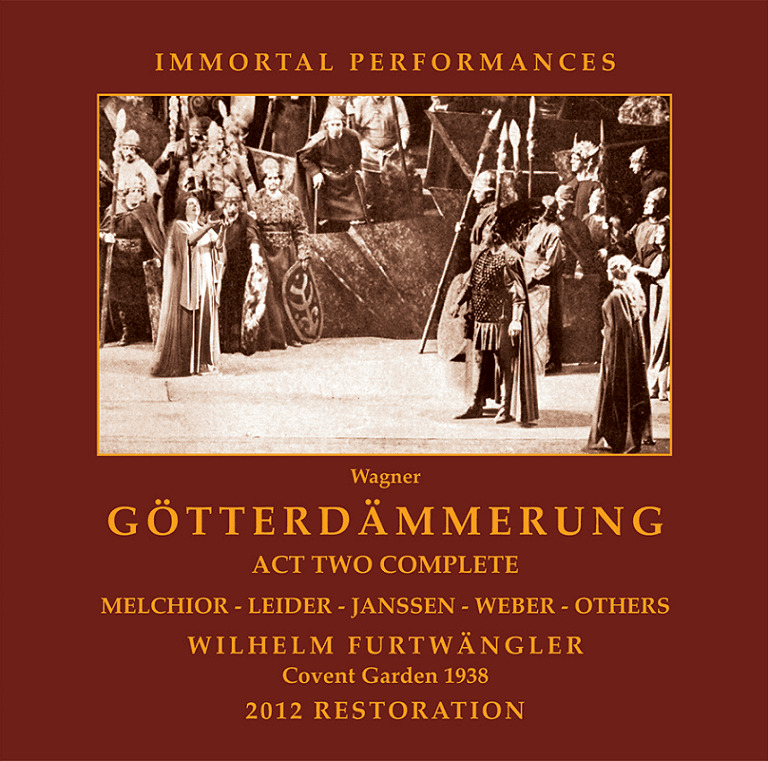 Parts of the 1938 Covent Garden GOTTERDAMMERUNG have been issued before, but never in sound this good....This is as fine an example of treating historic material with respect and integrity as I’ve encountered, and frankly most listeners will be shocked at how good this sounds! It is hard to know where to start when discussing the performance. 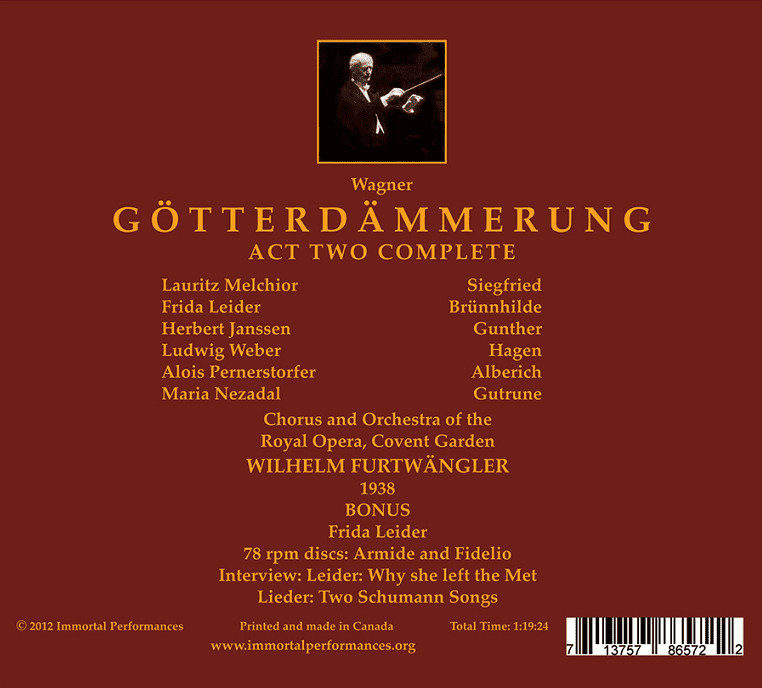 Perhaps with Leider, if only because recordings of her in major Wagnerian roles are rare, and live recordings of her even rarer. This is magnificent singing, with a warm, full tone and a soaring majesty that leaves the listener agape. The top rings free, even at age 50, the tone is solid and even from top to bottom, and she sings with presence and intensity. There is a warmth to the voice, a glow, that is unique - neither Flagstad nor Nilsson could duplicate those qualities to this degree. Then you have certainly the greatest Heldentenor of the 20th century, Lauritz Melchior. He was often criticized for sloppiness, lax rhythms, inattention to detail, and lapses in concentration. We hear not an iota of that. What we hear is a golden voice, attentive to text and dramatic context, and able to produce both a beautiful legato and warmth of tone combined with a vocal weight, a heroic timbre, in a way that has never been duplicated. The rest of the cast is excellent and little needs to be said about Furtwangler’s Wagner conducting, since it has all been said before. He is overpowering here, and the Royal Opera House Orchestra plays beautifully for him. This is not remarkably different from his RING performances in Italy in the 1950s, except perhaps just a touch lighter in texture and swifter in spots. But this was what John Steane, in his wonderful book THE GRAND TRADITION, calls ‘one of the best of opera nights’. Everyone is clearly inspiring everyone else.